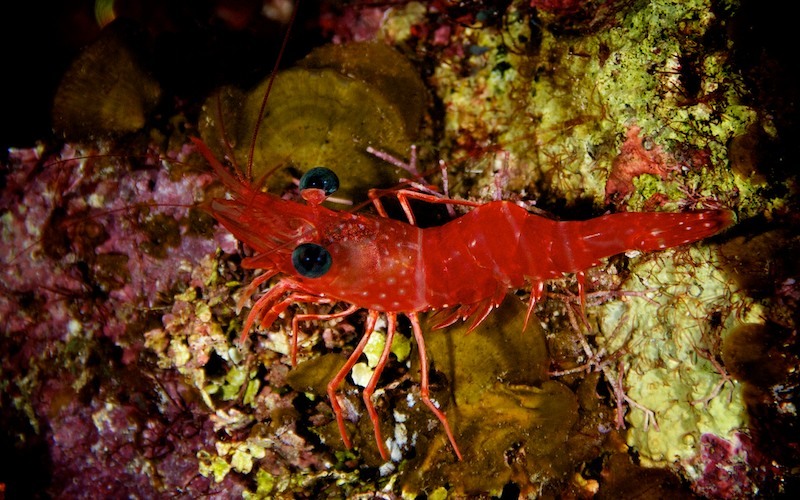 Caption: Shrimp, sometimes called prawn, are stalk-eyed swimming crustaceans with long narrow muscular tails (abdomens), long whiskers (antennae) and slender legs. They are related to crabs and lobsters. Unlike crabs and lobsters, they are more adept at swimming than walking. Their abdomens are largely dedicated to powering their swimming equipment. They swim forwards by paddling with swimmerets on the underside of their abdomens. Like lobsters but unlike crabs, they swim backwards by flipping their tail fan. Crabs and lobsters have strong walking legs, whereas shrimp have thin fragile legs which they use primarily for perching.